These Halloween cards are super cute and easy to make. They’re similar to the DIY mini cards and envelopes that I made for Halloween last year. 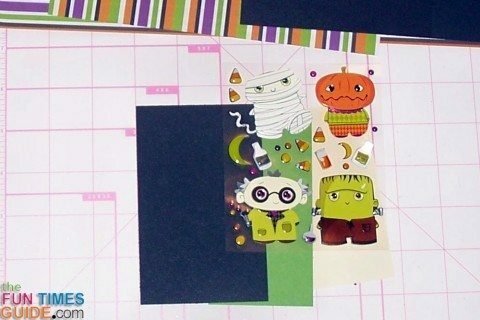 All you need is some simple Halloween stickers and Halloween colored paper scraps! 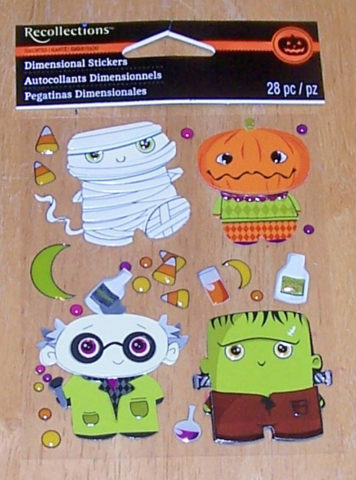 I used dimensional Halloween stickers (pictured, from Michael’s), but you can use any kind of Halloween sticker you may have. I think Halloween dimensional stickers look best. I took an opportunity to use small pieces of my paper scraps from the DCVW Fall Stack along with scraps of plain cardstock to make these Halloween cards. 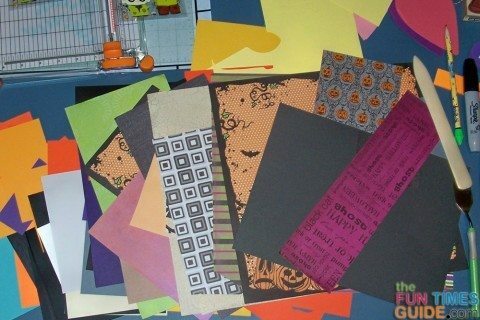 If your scrap paper colors don’t seem to match your stickers, then consider getting a packet of scrap paper or some Halloween themed paper. The base of each card is solid-color cardstock paper, folded into a 4×4” square card. I planned each of these cards to open from the right, but they could just as easily open from the bottom if you prefer that style. The next step is to plan the coordinating papers to place on top of the base. The great thing about the dimensional Halloween stickers I used is the fact that they’re packaged on a clear piece of plastic, so you can see what the sticker will look like with different color options. For example, in this next picture, I was checking out color options for the mad scientist sticker. I initially thought it would look great on lime green paper, but once I tried it, I didn’t like how it looked. After I chose the color for underneath the sticker, I played around with my paper scraps to find the other papers to go on each card. Have fun with this part! Mix and match to find combinations that look pleasing to your eye and bring out the colors in the stickers. As you can see on my cards, each combination is unique — sometimes using a patterned paper, sometimes using all solid colors. Center each sticker on a square 2×2″ paper scrap. Place that on top of the next layer: a square of 2.25 x 2.25” paper. This allows a small frame of color to show. The next piece of scrap paper is the biggest at 3.5 x 3.5”, and you can see that I chose this square for my brightly colored patterned paper since it has the largest frame showing. This final square is then centered on the front of the card. The inside of each card has one or 2 squares of paper, depending on how dark the colors are. If the main square is too dark to write on, I add a smaller square for writing. These squares are 3.5 x 3.5” and 3×3”. Some of the stickers on the sheet were tiny ones that seemed to match the main sticker, so I added those randomly to the front and sometimes on the inside of the card. Since most of my remaining matching paper scraps were too small to make an envelope, I made a matching envelope liner to coordinate with the card. The envelopes are rectangular shaped (4.5 x 6”) instead of square like the cards — because square cards require more postage. 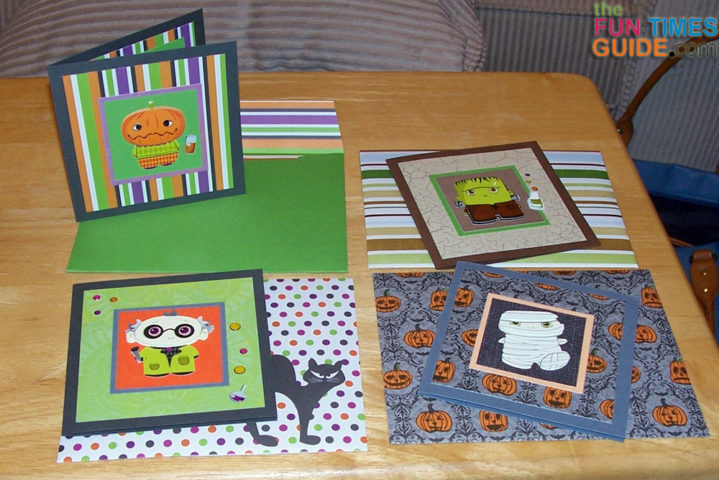 I hope you have fun making these spooktacular Halloween cards.